The VSG3ST6 is an enhanced simplex High-Speed STP macro with data transfer capabilities of up-to 6.25/12.5Gbps. It includes a Standard ARM HS-STP simplex interface. In addition, on the same footprint using Gigacom’s technology, it can include a standard JTAG interface. 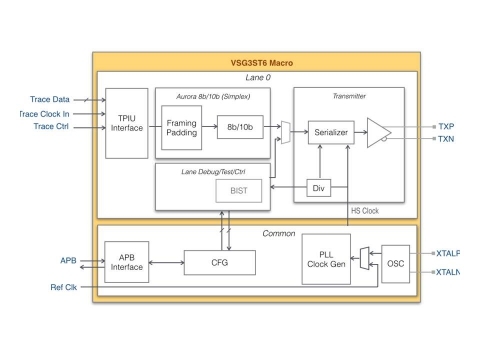 The VG3ST6 can be paired with an HS-STP compatible receiver system to create a flexible debugging platform customizable for nearly every silicon bring-up strategy. The figure shows a typical example of application.